NORTH EASTON, Mass. – The Milford boys soccer team hasn’t had much success against Oliver Ames since it joined the Hockomock League in 2012. That changed in a big way on Monday night in a rainy contest on the turf at Val Muscato Stadium. Milford had a dominant showing, scoring four first half goals on its way to a convincing 5-0 win. It marked the Scarlet Hawks’ first win over the Tigers since joining the league, snapping a 10-game winless streak. “We talked about coming out strong in this game,” said Milford head coach Brian Edwards. “Some of our previous games, we started out weak and were fortunate to get points out of them because of the way we started. So it was a point of focus the last couple of days, and I was very happy with the energy level. It was all Hawks from the get-go, registering their first scoring chance just over 60 seconds into the contest. Sophomore Leo Coelho played a perfectly weighted through ball on the ground that found junior Walisson de Oliveira right inside the area, but his touch was smothered by OA keeper Jacob Lerman. Although de Oliveira had his first chance denied, it was far from the last time he would factor in. In the 5th minute, de Oliveira blasted a free kick from 35 that went just high and wide at the near post. In the 8th minute, Coelho made a darting run out of the back, combining with de Oliveira to eventually find Joao Vitor, but his shot went just over the bar. The visitor finally converted in the 12th minute. Jordan Borges played a long ball out of the back that skid on the turf past the defense. Miscommunication between the OA defense and keeper allowed Vitor to come streaking in and get a touch past the keeper. de Oliveira was in the perfect spot and cleaned up the loose ball, burying it into the back of the net to make it 1-0. OA had a nice spell of play over the next 10 minutes, nearly drawing level of two chances. First, sophomore Colin Milliken took a feed from classmate Jimmy Keane and ripped a dipping shot from 25 yards. 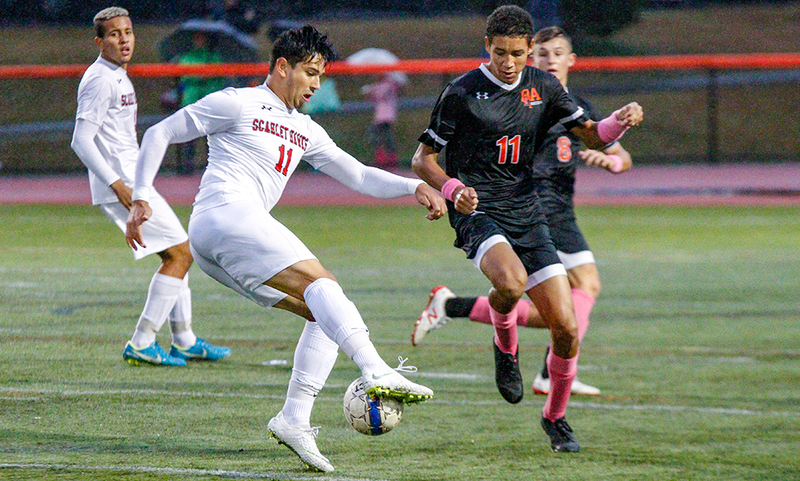 The ball nearly skipped in front and almost slipped through Milford keeper Josh Orellana’s hands, but the senior positioned himself well to cover. Just a minute later, a free kick from Niko Byron fell to the feet of Brady deVos, and the sophomore had a go from atop the area, but Orellana made a terrific jumping save and gobbled up the rebound. Just seconds later, Milford’s Anthony Salvador traced down the left flank, centered to Vitor and his curling shot from just before the 18-yard line found the back of the net despite a partial save. After going up 2-0, Milford continued to apply a heavy dose of pressure while controlling possession of the game. In the 32nd minute, de Oliveira really put the Hawks in the driver’s seat. The junior used a nice cut to get past a defender, took a touch towards goal and fired a laser from 25-yards out that went just under the bar for a 3-0 lead. The Hawks added to their lead with another terrific goal just two minutes later. An attack throw from Tiago Carvalhoj was flicked on by de Oliveira to sophomore Lucas Da Silva. Da Silva took a touch to get the ball on his right foot and then ripped a volley to the far post for a terrific goal, giving Milford a 4-0 lead heading into halftime. “Wally is a beast, first and foremost,” said OA head coach John Barata. “But today was the first time our inexperience really showed to be honest. It’s not an excuse, but it really showed today. And on top of that, we gave up two bad goals to start. We had a miscommunication on the first one and the second one was unfortunate. When you go down two to them, you have to come out and go for it. We played great for 15 minutes, and then they put in two in two minutes. The second half featured fewer scoring chances for both sides, but quality chances nonetheless. de Oliveira had a free kick from 40 yards out tipped over the bar from OA sophomore keeper Drew Nikla. In the 49th minute, Milliken curved a free kick to the far post from 25 yards out, but Orellana covered nicely to deny the shot. Two minutes later, Carvalho had a long clearance bounce over the OA defense. Vitor ran onto it, but Nikla came well off his line and blocked the shot with his body outside of the area. Milford capped the scoring in the 65th minute when Salvador got his second assist, setting up de Oliveira’s hat trick. Salvador sent a ball into space between two OA defenders. de Oliveira made a diagonal run to beat his defender and latched onto a shot from inside the area that found the back of the net. Milford boys soccer (5-1-2 Hockomock, 5-1-2 overall) is back in action on Thursday in a big division clash against Canton at 6:30. The Bulldogs sit two points ahead of Milford with one more game played. Oliver Ames (3-1-4, 3-1-4) will try to bounce back from its first loss when it hosts King Philip on the same day at 3:45.